Below, in 1912: Ethel (back center) with her parents John & Etta Tibbets, brothers Jean, Earl, and Carl and baby sister Lona. My grandmother Ethel Tibbets was always very independent and adventurous as I recall. She was also very small in stature being only 4'10" tall but she bore and raised 8 sons in 18 years while moving from one state to another. Grandfather was over 6' tall so he needed to be seated when they had their picture taken together. 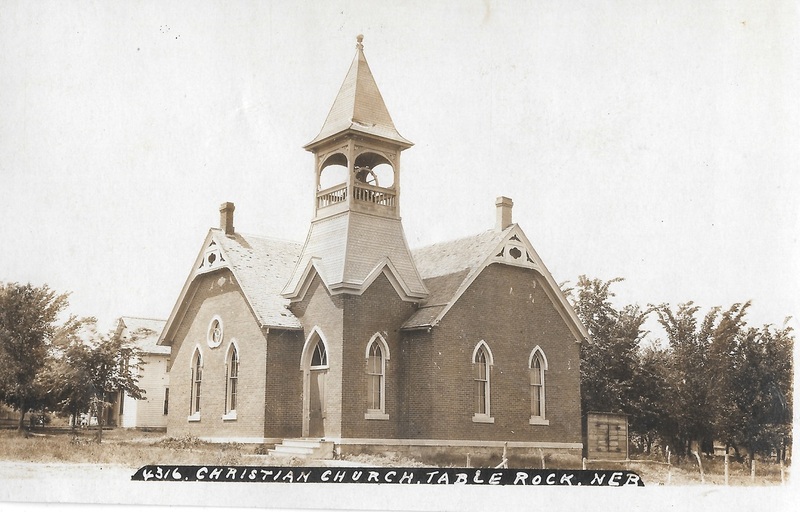 Grandmother told me about her life growing up in Table Rock NE. Here is the story. I thought people might find it interesting about the way they lived in the early part of 1900s. When Ethel was 4 years old in 1900, her great-grandfather and her parents took a trip from Table Rock, Nebraska to Burlingame, Kansas [a distance of 120 miles by covered wagon. They went to visit Owen’s brother James Crisler. It took one week to get there. They crossed the Kansas River on a ferry at St. Mary’s, Kansas [a distance of 82 miles]. The trip was something grandmother remembered as being an exciting adventure. When Ethel was 10 years old she packed her suitcase and went to the train station where she purchased her own ticket and went to visit someone in another town. ​When she was 15 years old she babysat with a little 3 week old baby who had colic. His father told Ethel they hadn't had much sleep and he needed to sleep. She went outside and cut some catnip, making a weak tea from it and gave a tiny bit to the baby. He slept the entire night. The young people had square dances at people's homes. They usually all went in a "hack" pulled by a team of horses. The hack is similar to a coach with windows and a door. Ethel went to another town with some friends to a dance one evening and it got very cold. When they left in the "hack" it was so cold the boys had to trade off driving every few miles so they wouldn't freeze to death. They didn't get home until 4 a.m.
Ethel waited tables at the Christian Church on Sunday nights when they had suppers at the church. 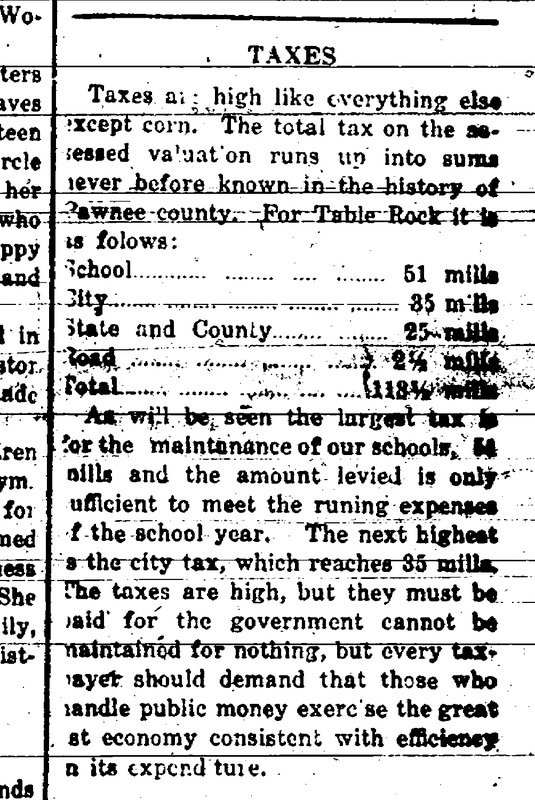 Ethel’s grandfather William Crisler earned $30 per month taking care of the school at Table Rock, where he was employed as caretaker for over 30 years. The school children and many townspeople called him “Dad” Crisler. Ethel remembered getting up early to help him make fire in the boiler to heat the school in winter. 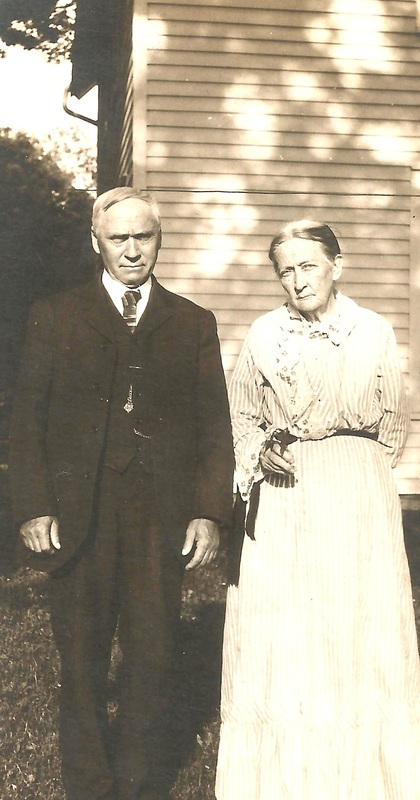 Ethel’s parents, John and Etta Tibbets, lived on a farm northwest of Table Rock, where Ethel was born. They lived with John's mother Kesiah (Nicholson) Tibbets. When Kesiah died in 1903, the farm had to be sold and divided up among the heirs. Ethel was just 6 years old at this time. 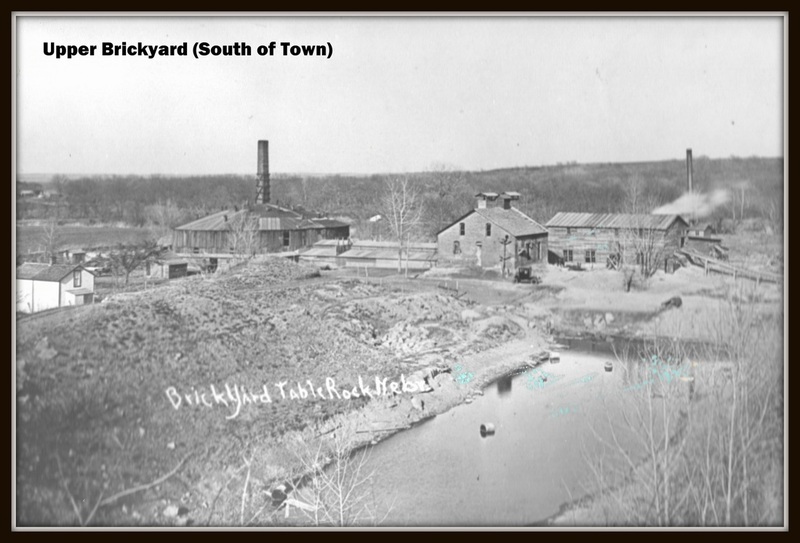 John Tibbets and William Crisler worked in the town brickyard. They mixed mortar and poured it into molds. After the bricks dried they removed the mold and took the bricks to another area where they built a fire on them to bake them. In those days, towns were building and they usually had a brickyard and sawmill so they would have plenty of material to build with. Table Rock is built along a creek and the town area is made in a town square with a large park in the square which spreads to one block each side. They had ice cream socials and band concerts in the park. Ethel’s family lived in town for five years. John’s older brother Oscar and his wife Martha helped put the children through school. Their two young sons had died in 1881 and 1882 when they were only ten and eleven years old. Ethel lived with Oscar and Martha during this time because she was the oldest child and could help them at their store. They owned a variety store with one side a grocery store and the other a millinery shop where Aunt Martha made and sold hats and material. Aunt Martha made two hats every year for Ethel. John and Etta moved back to the farm. Ethel was in high school by this time. She had gone to a rural school for first through eighth grades. The only high school was in town 2 1/2 miles away. The children had to walk 2 1/2 miles each way to school every day. Since school started at 8:30, they had to leave home about 7:00 a.m. The younger brothers couldn't walk as fast and sometimes the youngest one would get tired and just sit down in the middle of the road, and then Ethel would have to carry him. After school the neighborhood children would get together and play cards. They traveled from one farm to another in a buggy pulled by a horse. Ethel quit high school after completing 2 years. 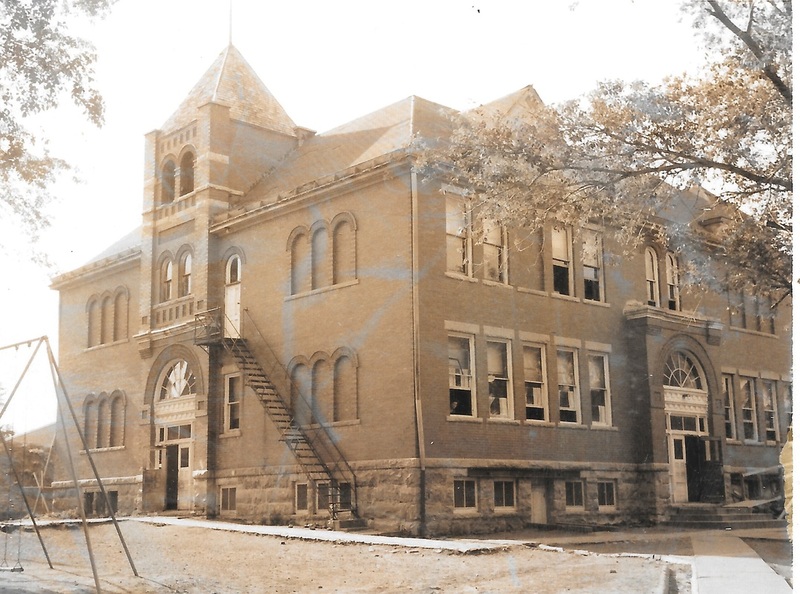 The town school, built in 1902, would have been relatively new when Ethel went there. ​They raised hogs, chickens and cows on the farm. Ethel had a couple of cows to milk each morning. There was no electricity at the farm and the roosters would wake them up early each morning. The newspaper came once a week and it had a continuing story in it. Ethel got the paper and hid it until she read the story first. ​The newspaper came once a week and it had a continuing story in it. Ethel got the paper and hid it until she read the story first. Ethel started wearing glasses when she was about 14 or 15. Ethel lived at home for 25 years, until she had been three years. She was born and married within 1/2 mile. Ethel's parents lived on the farm for 6 years, until 1916. 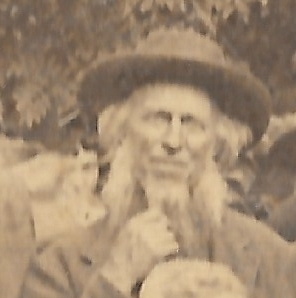 Owen had served in the Civil War in Company F, 154th Illinois Volunteers. When Ethel’s great grandfather Owen Crisler died in 1910, he was living with her Ethel’s grandfather William and his wife. Owen was called "Big Grandpap" because he was over 6 feet tall and weighed 200 lbs. He smoked a corncob pipe and had a long white beard. His hair was bald in the middle and he wore it turned down around the bottom and over his ears. He had several small strokes his last years and a massive stroke the day before Christmas 1909. He was completely invalid and died a week later on Jan 3, 1910. Ethel and John Ward went to the same school in Table Rock but it's not known how far John went in school. Ethel said she always did all the writing and John would sign his name. John's mother died when he was just 4 years old of pneumonia and his father couldn't take care of him properly. John was passed around and stayed wherever he could with neighbors who needed a strong boy to help on their farms. 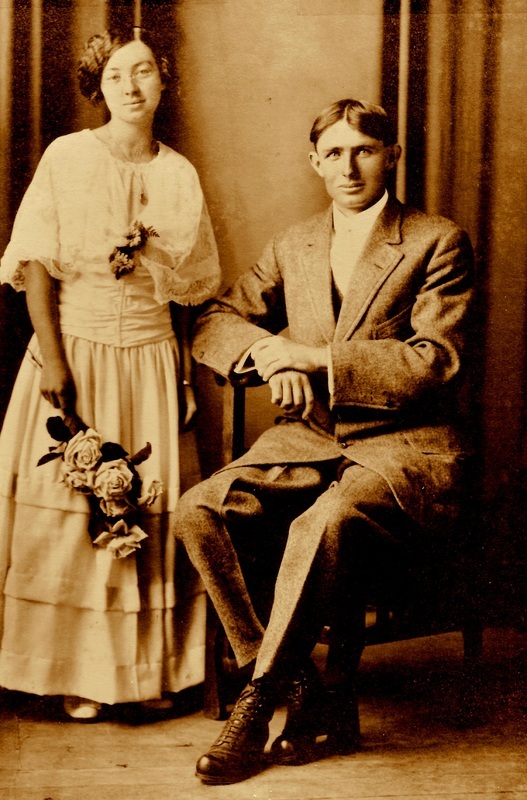 They were married Sept 1, 1915 at the Christian Church in Table Rock and she and her mother made her wedding dress. The fabric was called "Henrietta" and there was an 18" width of lace over the top. They lived on a hog farm through the first winter and cared for 100 hogs. Ethel helped John break a team of mules with a horse that had been raised by a woman. Men had trouble handling the horse but Ethel never had any problems with the horse. who had been trained as a buggy horse. 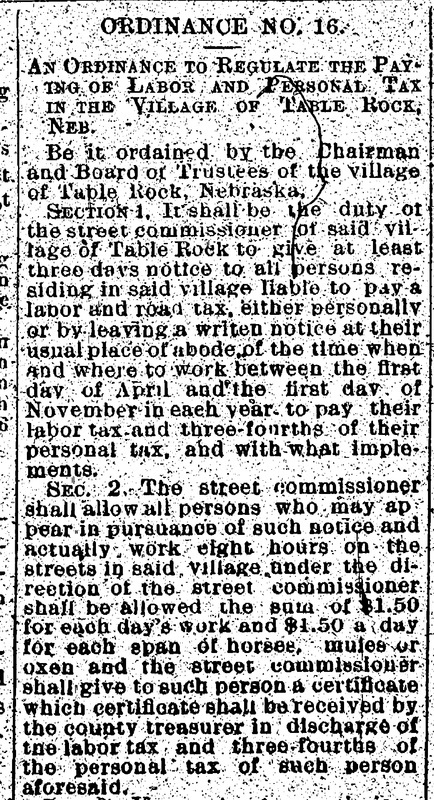 Ethel said John would work on the roads during part of the year to pay their income taxes. The roads at that time were not maintained very well and there were no "paved" roads at all.